Readers of this blog are likely familiar with the Oblivious Investor blog. Its author, Mike Piper, is a frequent commenter here. (He signs as ObliviousInvestor. It’s an SEO thing.) And it’s been on my blogroll for a long while now. 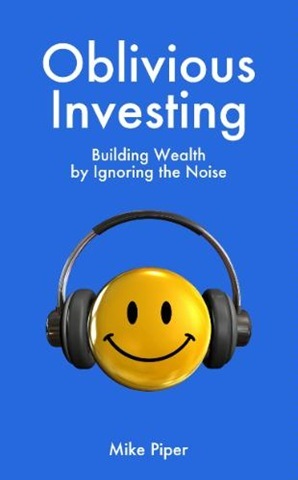 So, naturally, when Mike put out a book version of his blog, Oblivious Investing: Building Wealth by Ignoring the Noise , he bravely sent me a free copy in the hopes that I would say something nice about it. You have to admire his courage. I rarely say nice things. I was a little worried myself, but truthfully I have only two significant problems with this work. 1) It takes the form of a fictional narrative, which I find annoying. 2) It doesn’t fully explore some topics that I think are interesting. In other words, it’s not written the way I would have written it, and that’s an objection I have to almost everything. That said, most of the relatively short book is taken up with making a case for a good investment plan based on regular investments into an equity index fund. Avoid individual stocks, active mutual funds, and fixed income. Of course, the book also stresses the importance of sticking with this plan in the face of short-term volatility. In the end, the main character is rewarded for her perseverance when the market was going down. I am sympathetic to the thesis that conquering your own emotions of fear and greed is the hard part. I just wish Mike had spent more time in the book exploring why that is the hard part. It may only apply to over-educated intellectuals like me, but I find arguments for cures that include an explanation of the workings of the disease to be more convincing. Without a story about human psychology and the tricks our heads play on us in certain situations, it is too easy for people like me to think that, although this might make sense for some, we don’t need to be oblivious because we are enlightened and perfectly logical in our decisions. Mike teases a little on this topic on the very first page, describing checking your fund balances and moving your money from place to place as “attempts to exert control over something that we simply cannot control.” Exactly so. The compulsion to do something when you lose money (or see others making more money) is a powerful human impulse. It’s the basic instinct of reacting to a negative stimulus. When I worked at a large investment firm and things went bad we used to tell each other “Don’t just do something, stand there!” If anything, that is harder for pros to do, because they have clients who expect to hear about the steps their manager is taking to fix whatever the problem was that caused the fund to lose money. Experienced fund managers often have a little repertoire of meaningless and harmless “actions” that they can take in such situations to appease the clients. But my modest disappointments with Oblivious Investing can be largely attributed to the fact that I am not the intended audience for it. Unlike me, Mike actually spends his days giving practical advice to those who need it, rather than just criticizing the advice of others. And this book is aimed at those end-users. I would never recommend a single book to person just beginning to learn about investing. But I might recommend half a dozen good books, because I think that getting several perspectives and understanding where reasonable people disagree is vital. And Oblivious Investing might be one of those six. Now, if I can only find the other five…. Wow, Frank, coming from you this feels like a pull-out-all-the-stops rave review. Thanks for taking the time to read and review the book. I quite appreciate it. OI, props to you for putting in the effort to writing your own book. That is no small feat for sure; I’ll have to check out your work. I’ve recently noticed that there seems to be two very opposed camps out there regarding passive or active investing. Is that just indicative of academic convictions? Some of the online discourse seems rather harsh. You’re right, there’s a lot of discussion about active vs. passive investing. 1. The writing done by unbiased observers (academics, for instance) that notes that passive funds consistently outperform the majority of active funds. 2. An entire industry that relies upon convincing you that their actively-managed funds will outperform the market. I believe it’s a similar conflict that generates the ongoing discussion about picking stocks and actively trading vs. buying and holding passive index funds. Without a story about human psychology and the tricks our heads play on us in certain situations, it is too easy for people like me to think that, although this might make sense for some, we don’t need to be oblivious because we are enlightened and perfectly logical in our decisions. Yikes! This sentence sure explains why Frank and I don’t see eye to eye re some important investing topics. I believe that it is 100 percent impossible for ANYONE (including Rob Bennett, to be sure) to be “perfectly logical” in his or her investing decisions. I like to think of myself as the most severe critic of Passive Investing (I love indexing, it’s passive asset allocation that I cannot stand) alive on Planet Earth today. So it would not be natural to expect me to be a big advocate of the approach described in Mike’s book. That said, there are two good things I can say about it based on what I’ve read here and based on my earlier interactions with Mike. One, I strongly agree with Mike that the tough part is not coming up with the plan but sticking to it. One good thing that the Passive Investing Era has brought us is a beginning of an effort to look at this sort of question. I hate Passive Asset Allocation. But I also believe that it is an era that we had to live though to get to a better place. The Passives put some important questions on the table and it sounds as though Mike explores some of those questions in his book. Two, I was very much impressed with the sense of humor Mike evidenced when I asked to write a guest blog at his site. He said “A blog entry disagreeing with everything I advocate? How could I say no?” And he did run the guest blog entry. I think he came close to taking it down at one point, but he resisted the urge. That evidences confidence in the message being advocated. I haven’t seen too many other Passive Investing advocates evidence that level of self-confidence in their message and I was highly impressed by what I saw. If you have an interest in sending me a copy of your book, I am willing to promise to look at it and to write a blog entry on it, Mike. I doubt very much that I would end up endorsing a Passive approach. But I would certainly try to be balanced in what I wrote. My guess is that I would focus on those sections of the books exploring what is needed to stick with the plan and critique your recommendations in that regard. I certainly applaud anyone who publishes a book in this area as each book adds something to the debate, increasing our collective understanding at least a notch. My take re this one is precisely the opposite of the take put forward by Mike (Oblivious Investor). The way I see it is that the idea that it is okay to stick with a single stock allocation was all the rage in the 1960s and 1970s, but has been discredited by the academic research of the past 28 years (Shiller put out the first research showing that valuations affect long-term returns in the early 1980s). The weight of the academic research is today strongly AGAINST the Passive concept, but the Stock-Selling Industry has directed hundreds of millions of dollars to promoting this idea and is EXTREMELY reluctant at this point to acknowledge the errors made in the formulation of the now-discredited model. So most “experts” continue to advocate Passive even though they are aware of the many holes in the idea (I don’t think that most experts know how bad it is because they resist examining a question that they find painful to consider). The other factor is the big price crash. The idea of sticking with a single stock allocation is a 100 percent emotional choice, in my assessment. The idea that this might work always catches on in out-of-control bulls, when millions are looking for a rationalization for failing to adjust their stock allocations to keep their risk level roughly constant. And it seems to work for the length of the out-of-control bull. But out-of-control bulls make out-of-control bears inevitable and the Passive approach performs as poorly in the aftermath of the huge bull as it performs well during the time that market prices are irrational. We are now in the early years of the payback time that we forced into existence with our too easy acceptance of the Passive Investing marketing slogans. I told you I wasn’t a big fan! This sounds like a rave review, Curmudgeon-style, to me!